BlackBerry Tour 9630 ( also known as BlackBerry Niagara ) is the upcoming smartphone from RIM ,after BlackBerry storm which was released on this January . Sprint and Verizon Wireless in US and Bell -Telus in Canada will offer the phone from coming July for an expected price of 199$ with two years contract .BlackBerry Tour adapts its design from existing RIM smartphones like Blackberry bold and Blackberry curve .Major specifications includes 3.2 mega pixel camera with video recording ,256 MB ROM and 16GB expandable memory . BlackBerry Tour has GSM and CDMA support and is considered to be world phone due to its system design to operate on 3G/ EDGE networks in more than 150 countries . So it seems that BlackBerry Tour will be launched in India too . 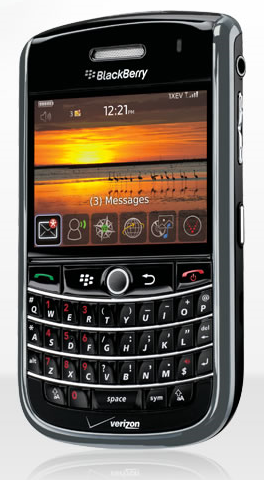 BlackBerry design ,hardware and communication is a combination of BlackBerry smartphones Bold and Curve (8900) . Design looks more similar to Blackberry curve 8900 , but the data capabilities like 3G and international roaming adapts from Bold . 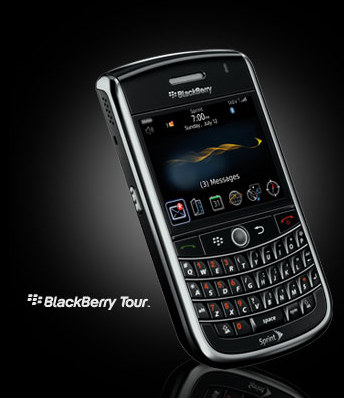 Blackberry Tour is missing WiFi connectivity just like in Blackberry storm and this considered to be the major drawback of this device . Full specifications and comparisons can be found here . Verizon Wireless and Sprint have set up their pre-order or information portals for BlackBerry Tour smartphones . Verizon’s price for BlackBerry Tour is 199 $ with two year contract , and Sprint is yet to reveal their offers .BlackBerry tour is designed to supports networks all over the world . So in India we an expect the phone through Airtel or Vodafone .